Get More Miles For Your Dollars! Report A Pothole in the Denver Area! Tips for Making Your Car Green! On this show, my goal is to help you get the most miles for your dollars out of your car and to help you avoid getting ripped off. I love to help people understand why I recommend the preventative maintenance service that I do, how to make good decisions when having their car serviced, and what people can do to prolong the life of their car. I’ve posted several segments of the show below. The Monday Morning Mechanic shows off a new life-saving device for your car. Winter Driving: what to check BEFORE it gets snowy and icy! Save $ Even When Your AC is on! What to look for when buying a used car! See Clearly this Spring to Stay Safe! Clean Fuel Injectors Means Better Gas Mileage! Take care of your CLUTCH! 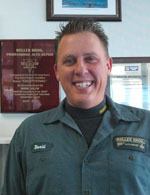 All Oil Changes Are NOT The Same! I've been helping shops like yours across the country for years. Learn how I can help your shop, employees and marketing by clicking here! Copyright © 2019 by Keller Bros. Auto Repair. All rights reserved. Site design by Automated Marketing Group.